Vertebral compression fracture is the term given to bones of the spine (i.e. the vertebra) that have collapsed. This is due to defects or weaknesses in the bone, causing reductions in its height relative to the bones on top of or below it. These defects accumulate until cracks appear in the bones affected. As a result, the bone can no longer hold up its portion of the load on the spine. This results in hunching of the back or loss of height. Compression fractures in the neck may also adversely affect the joints between vertebrae, which will also cause pain. Cracks in spinal bones may also result in painful compression of the spinal cord, due to its abnormal structure. Vertebral compression fractures are common in cases of osteoporosis, which is a loss of bone density. 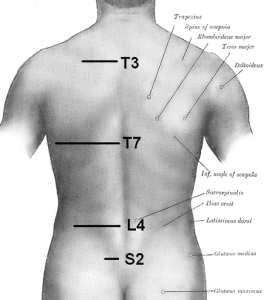 They are also associated with cancers in the bone or malignant tumors on the spine. Vertebral compression fractures are most often seen in older individuals. Fractures can also result from motor accidents, or falls from up high. In these cases, medical treatment should be applied straight away. 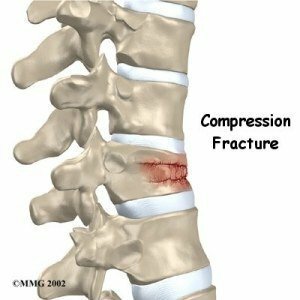 Compression fractures can cause chronic pain and may even result in spinal cord injuries or paralysis if left untreated. If the pain from compression fractures is relatively mild, it can be managed by oral painkillers such as non-steroid anti-inflammatory drugs (NSAIDs). Other examples of oral medications for pain are opioids, such as morphine or codeine. These drugs carry risks of psychological dependence, tolerance, and organ failure if taken consistently over a long period of time. The most effective treatment for vertebral fractures is vertebroplasty. In this procedure, the area of the back above the broken vertebra is anesthetized. Then, a thin needle is inserted into the affected vertebra and acrylic cement is injected. This repairs the break, and restores vertebral material, which in turn should correct posture and/or restore lost height. A variation on this procedure is kyphoplasty, in which a small balloon is inserted and inflated to lift the bone so that cement can be appropriately added. Vertebroplasty and kyphoplasty are effective in treating vertebral compression fractures. They have minimal risks, such as infection and bleeding at the site of needle insertion. There is also a possibility that the cement may “leak” out of the bone, causing inflammation and thus further pain. These procedures are common in patients suffering with osteolytic cancers (which erode bone) or spinal tumors. Vertebroplasty or kyphoplasty are often combined with other pain-relieving techniques for maximal effect. An example of this is a nerve block, which involves injections of steroids and local anesthetics, given via needle directly to spinal nerves as they are responsible for sending painful stimuli to the brain. Nerve blocks in the back and neck are effective in pain relief for patients with vertebral compression fractures. Blocks can also be applied to the joints between cracked vertebrae to relieve pain. 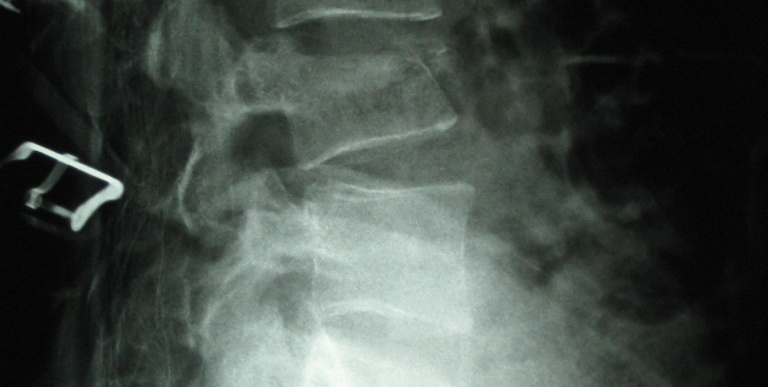 Another technique often combined with vertebroplasties for treating vertebral compression fractures is radiofrequency ablation. This technique involves the introduction of thin probes through the skin. These probes deliver electro-thermal impulses to the pain-transmitting fibers of spinal nerves, which blocks recurrent pain more completely. Radiofrequency ablation may cause bleeding, infection, and paralysis due to inadvertent motor nerve damage. Vertebral compression fractures are also be known as collapsed vertebrae. The vertebrae are the bones of the spinal cord that should function to protect the enclosed nerves, plus uphold and manage the weight on the spine. Compression fractures are a common side effect of diseases such as osteoporosis or cancer. These erode the bones until they collapse, and may cause loss of height and poor posture (i.e. hunching). This condition is associated mostly with people of 50 years and older. Mild compression fracture-related pain can be treated with standard oral medications such as NSAIDs and opioids. The main treatment for very painful collapsed vertebrae is vertebroplasty. It involves the injection of acrylic cement into broken vertebrae to seal breaks. 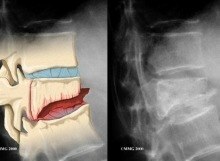 A variation on this is kyphoplasty, in which a balloon is inserted and inflated to lift the collapsed bone prior to cement injection. Techniques such as nerve block and radiofrequency ablation may be combined with cement injection to ensure long-lasting pain relief from compression fractures. Hoffmann RT, Jakobs TF, Trumm C, Weber C, Helmberger TK, Reiser MF. Radiofrequency ablation in combination with osteoplasty in the treatment of painful metastatic bone disease. Journal of Vascular and Interventional Radiology. Mar 2008;19(3):419-425. Song HM, Gu YF, Li YD, Wu CG, Sun ZK, He CJ. Interventional tumor removal: a new technique for malignant spinal tumor and malignant vertebral compression fractures without epidural involvement. Acta Radiologica. Oct 16 2013. Munk PL, Murphy KJ, Gangi A, Liu DM. Fire and ice: percutaneous ablative therapies and cement injection in management of metastatic disease of the spine. Seminars in Musculoskeletal Radiology. Apr 2011;15(2):125-134. Masala S, Lunardi P, Fiori R, et al. Vertebroplasty and kyphoplasty in the treatment of malignant vertebral fractures. Journal of Chemotherapy. Nov 2004;16 Suppl 5:30-33. Masala S, Roselli M, Massari F, et al. Radiofrequency heat ablation and vertebroplasty in the treatment of neoplastic vertebral body fractures. Anticancer Research. Sep-Oct 2004;24(5b):3129-3133. Shimizu F, Kawai M, Koga M, Ogasawara J, Negoro K, Kanda T. Case of painful muscle spasm induced by thoracic vertebral fracture: successful treatment with lumbar sympathetic ganglia block. Rinsho Shinkeigaku/Clinical Neurology. Oct 2008;48(10):733-736. Yoon JY, Kim TK, Kim KH. Anterolateral percutaneous vertebroplasty at C2 for lung cancer metastasis and upper cervical facet joint block. The Clinical Journal of Pain. Sep 2008;24(7):641-646.